© Sukur et al. ; Licensee Bentham Open. Inflammatory responses to wear debris cause osteolysis that leads to aseptic prosthesis loosening and hip arthroplasty failure. Although osteolysis is usually associated with aseptic loosening, it is rarely seen around stable implants. Aseptic implant loosening is a simple radiologic phenomenon, but a complex immunological process. Particulate debris produced by implants most commonly causes osteolysis, and this is called particle-associated periprosthetic osteolysis (PPO). The objective of this review is to outline the features of particle-associated periprosthetic osteolysis to allow the physician to recognise this condition and commence early treatment, thereby optimizing patient outcome. A thorough literature search was performed using available databases, including Pubmed, to cover important research published covering particle-associated PPO. Although osteolysis causes bone resorption, clinical, animal, and in vitro studies of particle bioreactivity suggest that particle-associated PPO represents the culmination of several biological reactions of many cell types, rather than being caused solely by the osteoclasts. The biological activity is highly dependent on the characteristics and quantity of the wear particles. Despite advances in total hip arthroplasty (THA), particle-associated PPO and aseptic loosening continue to be major factors that affect prosthetic joint longevity. Biomarkers could be exploited as easy and objective diagnostic and prognostic targets that would enable testing for osteolysis after THA. Further research is needed to identify new biomarkers in PPO. A comprehensive understanding of the underlying biological mechanisms is crucial for developing new therapeutic interventions to reverse or suppress biological responses to wear particles. Keywords: Aseptic, Loosening, Osteolysis, Particle disease, Periprosthetic wear debris. Total hip arthroplasty (THA) is widely and successfully used to manage end-stage hip disease. It significantly increases the quality of patients’ lives by reducing their pain and functional limitations. Advances in surgical techniques and in the materials used have led to an increase in the number of younger patients undergoing these operations. Thus, the total number of THA operations has risen significantly. Revision THAs are difficult to manage for patients and surgeons. Periprosthetic osteolysis (PPO) and the frequently associated aseptic loosening are the most common reasons for implant failures that require revision surgery in the long term . Dr. William Harris coined the term “particle disease” to stress the importance of the particles generated by a prosthesis in the induction of a host response, and it is a complex immunologic process caused by the physical and chemical wear of the implants [2, 3]. Consequently, osteoresorption predominates over osteogenesis at the level of the bone multicellular units around the implant, leading, eventually, to macroscopic bone defects . Clinically, particle disease reduces bone density through osteolysis, and causes aseptic loosening. Although osteolysis and aseptic loosening often coexist, osteolysis can occur in stable implants . PPO may remain asymptomatic for a long period of time, and the patient may have no functional complaints. Bone resorption proceeds insidiously and it becomes symptomatic when bone defects occur, which lead to implant failure, and revision surgery with its high complication rate becomes inevitable [6, 7]. Ideally, early detection would lead to timely interventions . Clarifying the etiopathogenesis and progression of particle disease is very important with respect to preventing PPO and aseptic loosening. This mini review aims to analyze and summarize the issues surrounding the biological mechanisms underlying osteolysis following THA. A functional artificial joint produces particles, regardless of its design or material characteristics. Usually, the particles produced by an implant are eliminated by the immune system’s cells, and a balance exists between their production and elimination. When the particle load production exceeds the immune system’s elimination capacity, the decompensation process begins. One study reported that acetabular cups with annual wear rates of under 80 mm3 were associated with very little osteolysis, cups with annual wear rates of between 80 and 140 mm3 had low-to-moderate osteolysis levels, and that cups with annual wear rates of over 140 mm3 had considerably increased osteolysis levels . The inflammatory reaction is independent of the type of particle, and its goal is to eliminate the foreign substance [10, 11]. Studies have shown that this is a cumulative and chronic inflammatory host response involving macrophages, in particular, and fibroblasts, lymphocytes, and osteoclasts. Decompensation of the immune cells shows that they are chronically activated, which disrupts the balance between bone tissue formation and breakdown via three major mechanisms. The first mechanism involves the exaggerated inflammation induced by the activated macrophages and osteoclasts, the second is the disruption of periprosthetic bone formation, and the third mechanism is the disruption of bone regeneration as a consequence of the increased cytotoxic response of the mesenchymal osteoprogenitor cells . These processes shift the balance from osteogenesis to osteoresorption at the level of the bone multicellular units, which leads to visible macroscopic bone defects around the implant . The degree of bone loss is, at least in part, a function of the number, size, and origin of the prosthetic particles that influence the number and depths of deregulated resorption sites . The particles emerge through wear and corrosion. Wear is the loss of material from two surfaces that slide over each other during motion under a load, and it can occur through abrasion, adhesion, and fatigue. Wear releases particles from the surfaces . The wear particles may be polyethylene (PE), bone, cement, metal, metallic corrosion products, or hydroxyapatite particles . In current arthroplasty technology, the contact surfaces are dual combinations of metal, PE, and ceramic. Different combinations of the type, size, and density of the wear particles alter the host’s immune response . For example, particles emerging from metal-on-metal (MoM) combinations will trigger B- and T-lymphocytes, and cell-mediated delayed-type hypersensitivity or type 4 hypersensitivity reactions that are associated with plasma cells. T-lymphocytes that are sensitized against metal ions or hapten-modified self proteins are processed by the type II major histocompatibility complex pathway, and they are presented to epitope-specific T-cell receptors. Corrosion is the chemical interaction between metals and their environment and their subsequent electrochemical dissolution. Corrosion may occur also due to fretting lead by the bimodularity that requires a junction between stem and head trunnion surface creating a second tapered interface as a source for relative motions. As a result this process causes constant repassivation, and consecutive deposition of metal oxide debris at the interface [16-18]. The clinical and histological features observed in periprosthetic tissue reactions surrounding corroded trunnions are quite similar to that of adverse local tissue reactions observed in defective metal-on-metal (MoM) and non-MoM bearings . However there does appear to be evidence to support the notion that trunnion-head derived particles may be more biologically active and destructive to soft tissues . A variety of local factors, including the solubility of the metal, the pH, and the properties of the organic components, cause the emergence of various corrosion products, which may be soluble or insoluble salts, metal-protein complexes, and free radicals. These corrosion products may be detected in the body fluids using a variety of digital technologies that include atomic absorption and inductively coupled plasma mass spectroscopy. Particles produced by wear or corrosion may disseminate locally or systemically [15, 21]. The characteristics of the particles, including their composition, size, shape, and number, particularly in relation to particles in the most biologically active, submicrometer size range, affect the overall cell and tissue responses significantly . These particles cause inflammation initially, which increases the number of inflammatory cells, and especially the numbers of macrophages and fibroblasts, in the joint fluid. The intraarticular pressure also rises, and the wear particles from the joint’s surfaces can migrate from the area, even when the prosthesis is very tight, and they will eventually spread throughout the joint cavity [22-24]. Each point that is in contact with the prosthesis comprises the effective joint space, and this area includes the cap, stem, and, when present, the screws. The joint fluid and, therefore, the particles migrate to lower pressure areas . Hence, particle disease can extend to new sites, thereby contributing to the overall expansion of osteolysis and the weakening of the bone-implant interface . Screw holes in the cap, the surfaces around the screws, and the areas with bone-cement separations or with coverage defects are most likely to harbor particles. Furthermore, compressed joint fluid can also induce bone resorption directly  Numerous studies have confirmed clear similarities among the histologic sections of tissue samples taken from various anatomic locations within the same patient . As the joint fluid and debris particles penetrate between the bone and the prosthesis, a synovial-like membrane develops in the area that expands aggressively. This interface membrane is a type of granulation tissue that contains abundant fibroblasts, macrophages, endothelial cells, and inflammatory mediators, and it also provides a shelter for cellular activities and enzymatic processes that may eventually destroy the neighboring bone . The aforementioned process is thought to be the pathologic mechanism underlying osteolysis [26-28]. The most common surface-bearing combination used today is a highly cross-linked PE socket placed onto a metallic acetabular inner cap and a metallic femur head . The interactions among the prosthetic’s components lead to the constant formation of PE debris at high concentrations, which spreads throughout the joint space. The most significant factor that determines the quantity of the PE particles produced is the volumetric wear, which is associated with the size of the prosthetic head. For example, a large 36-mm metal head causes volumetric wear and is associated with an increase in the number of PE particles. Conversely, when a small 22-mm metal head is used, linear wear occurs in the linear cap and the number of emerging particles is lower compared with the number generated from a larger metal head. Clinical loosening tends to occur as a consequence of bone loss, and often occurs with the wear of the PE cap . Particle size is as significant as their quantity. PE particle sizes range from 0.1 to 10 μm, and those that are between 0.1 and 0.5 μm are mostly involved in wear . Furthermore, when the total volume of the particle debris is considered, more large particles are present [9, 30]. Particles that are between 0.3 and 1.0 μm are the most potent stimulators of mononuclear phagocytes in vivo . If the particles are smaller than 0.3 μm, they are better tolerated, do not cause serious reactions, and they are mostly eliminated from the area by pinocytosis rather than phagocytosis. Unlike receptor-mediated endocytosis, pinocytosis is not specific in the substances that it transports. The cell takes in surrounding fluids, including all solutes present. Pinocytosis also works as phagocytosis; the only difference is that phagocytosis is specific in the substances which is transported. Phagocytosis engulfs whole particles, which are later broken down inside the cell by enzymes, such as cathepsins, and absorbed into the cells. Pinocytosis, on the other hand, is when the cell engulfs already-dissolved or broken-down particles. Although these small particles are not very reactive, they can accumulate and trigger a reaction. The debris material that is phagocytosed by macrophages tends to be comprised of particles that are smaller than 7 μm. Larger particles become trapped when they are surrounded by multinucleated giant cells . Although it forms smaller particles, cross-linked PE is more reactive than conventional PE, because the quantity of conventional PE particles needed to generate the same levels of stimulation and tumor necrosis factor (TNF)-α secretion is approximately 100-times greater than the quantity of cross-linked PE particles required. However, the use of cross-linked PE is safer and more common in clinical applications , because cross-linked PE inner caps undergo less volumetric wear. As stated previously, volumetric wear is the most significant factor that determines the quantity of PE particles that emerge; therefore, when cross-linked PE is used in vivo, the level of inflammation is lower. Basically, cross linked PE (ultra high molecular weight PE) has less wear, smaller and thus more particles, but the net result is less wear debris disease. PE wear debris is phagocytosed by osteoclasts, fibroblasts, and osteoblast/stromal cells in the soft tissues. The immune reaction against the PE particles is nonspecific, hence, there are few lymphocytes involved in the host’s response. Normally, material is broken down rapidly inside the phagosome following its phagocytosis. However, wear particles are resistant to enzymatic digestion [31, 32], and these debris products activate the inflammatory cells, which induces the release of proinflammatory cytokines and proteolytic enzymes . Signals that promote the release of TNF-α, interleukin (IL)-1α, IL-1β, IL-6, IL-8, and prostaglandin E2 (PGE) are triggered and these proinflammatory agents increase osteoclastogenesis. These proinflammatory mediators have indirect autocrine or paracrine effects, and they affect the functions of a variety of signaling mechanisms. Among these factors, TNF-α and IL-1β appear to have the most significant roles in a cascade that causes osteolysis. Phagocytosis is not always necessary for macrophage activation. Indeed, the macrophages and the particles may interact on the outer membranes of the macrophages, which may similarly stimulate the release of proinflammatory cytokines. This interaction may occur through a single receptor or multiple receptors, for example, cluster of differentiation (CD) 11b, CD14, and the Toll-like receptor (TLR) family [33, 34]. Nuclear transcription factor-kappa B (NFϰB) increases the expression of several genes that control proinflammatory cytokine production, including IL-1, IL-6, and TNF-α, in cells that contain particles. NFϰB activation appears to be the key step in the initiation of the host’s response. Recently, the receptor activator of NFϰB ligand (RANKL) pathway and osteoprotegerin (OPG) have been shown to play major roles in the initiation and progression of osteolytic lesions [35, 36]. Proinflammatory cytokines released into the environment reach the osteoblasts, thereby increasing the activation of the RANKL. The RANKL is a TNF-related cytokine that is produced by the bone marrow-associated stromal cells and osteoblasts. The RANKL is formed on the osteoblasts’ surfaces, released into the area in a dissolved form, and it increases NFϰB gene expression by binding to receptor activator of NFϰB (RANK). Consequently, the primary osteoclasts mature and osteoclastogenesis begins. The presence of the survival factor, macrophage colony-stimulating factor, is necessary for the transformation (Fig. 1). OPG is a trap receptor for the RANKL. It binds to the RANKL and prevents its connection with RANK, thereby reducing osteoclastogenesis . Recent studies have concluded that the osteoblasts and stromal cells in patients who have undergone THA and display aseptic loosening demonstrate a higher level of RANKL expression and a lower OPG/RANKL ratio in the synovial fluid than primary THA patients . Modulating RANKL activity by increasing OPG expression increases the significance of the RANKL/OPG ratio. This ratio plays a crucial role in the regulation of osteoclastogenesis and it is associated with a variety of bone diseases . 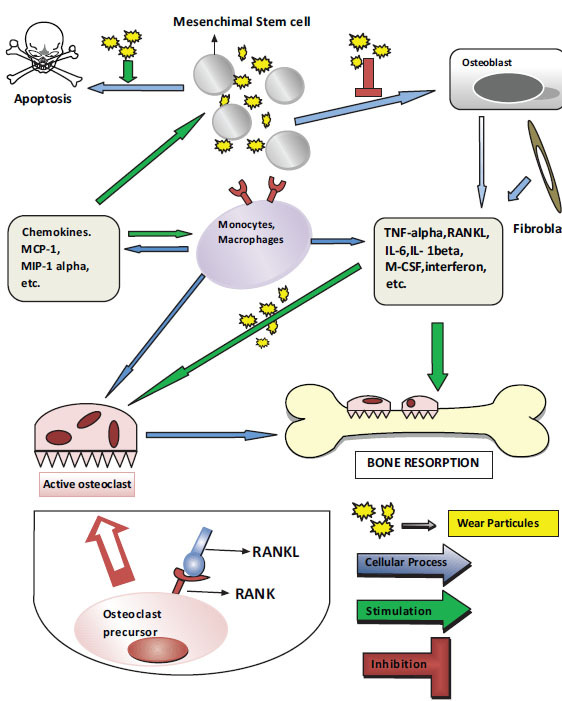 RANKL expression, which is induced in the cells within the inflammatory tissue in response to prosthetic wear particles, could promote an influx of osteoclast precursors and drive osteoclastic differentiation and activity, thereby promoting osteolysis. RANKL inhibitors appear to be a promising treatment modality for particle-induced osteolysis . Metallic particles are much smaller (0.05 μm) than PE particles. All hard-hard material combinations, namely, MoM or ceramic-PE, result in the formation of smaller particles compared with hard-soft material combinations, namely, metal-PE or ceramic-PE. The total volume of particles produced between MoM surface is much greater than other articulations . The immune response against the particles produced by MoM combinations is very potent, which highlights the importance of the material itself or its shape in relation to the subsequent immune response. A combination of adhesive and abrasive mechanisms underlie the wear of MoM surfaces. Wear debris formation is facilitated by wear caused by fatigue or cracks in the superficial and deep layers as a consequence of local repetitive loading. In non-MoM modular implants corrosion products may also originate from the head-collar or collar-stem junctions. It is strongly recommended that in vitro tests using human cells or cell lines as well as the accepted standard tests are undertaken to determine the impact of the release of the alloying elements [36, 40]. In the past few years, magnesium (Mg) has shown great potential as a material for biocompatible and bioabsorbable implants. The most attractive physical characteristics of Mg are its high specific strength and an elastic modulus that closely resembles human bone . Recent studies have highlighted the ability of Mg to stimulate bone growth and healing. Other recent experiments have confirmed that the presence of Mg enhances bone cell adhesion to alumina and that it is well tolerated by both osteoblasts and growth plate chondrocytes . The biological mechanisms associated with wear particles. MCP = monocyte chemoattractant protein; MIP = macrophage inflammatory protein; TNF = tumor necrosis factor; RANKL = receptor activator of nuclear transcription factor-kappa B ligand; IL = interleukin; M-CSF = macrophage colony-stimulating factor; RANK = receptor activator of nuclear factor kappa B. MoM weight-bearing surfaces produce metal particles and free metal ions as a consequence of metal (for example, cobalt [Co], chromium [Cr], titanium [Ti], nickel [Ni], and molybdenum [Mo]) corrosion. The ionic forms of the metal particles interact with the anions and proteins in the body fluids and the phagosomes, eventually leading to the formation of organometallic complexes, inorganic metal salts, and oxides. These complexes lead to the development of perivascular lymphocytic infiltrates and aseptic lymphocyte-dominant vasculitis-related lesions or lymphocyte-dominant immunological answer. These ionic compounds are of different sizes, and have different stabilities, resolutions, bioavailabilities, and bioactive potentials. In the tissues that surround a loosened implant there is often a type IV hypersensitivity reaction that comprises vasculitis and lymphocyte accumulations [38, 43]. An immune response that could be attributed to exposure to particular materials has not been demonstrated in all patients. Therefore, different mechanisms have been suggested. Metal ions produced on the MoM contact surfaces activate the endothelium and they increase lymphocyte traffic and adhesion. The endothelium plays a central regulatory role in tissue reactions against metallic wear products. In the absence of a type IV hypersensitivity reaction, lymphocytes that have migrated transendothelially and have accumulated in the perivascular zone initiate a reaction against the metal ions. The host’s response against the different metal ions varies. In an in vitro study, Catelas et al. observed that Co resulted in a higher level of TNF-α stimulation and that it had a higher stimulatory effect. As a consequence of the high level of TNF-α stimulation, Co has been reported to be more toxic than Cr, even at lower concentrations. Co and Cr ions cause dose- and time-dependent macrophage death . Furthermore, Ti reduces the number of osteoblasts by inducing apoptosis, and polymethylmethacrylate reduces osteoblast proliferation . Metal ion concentrations were higher in the bloodstreams of patients with MoM weight-bearing implants compared with those in the normal population. These metal ions and corrosion particles may circulate throughout the whole body and accumulate in tissues, including the brain, liver, and kidney. These accumulations may have side effects that include toxicity, carcinogenicity, and teratogenicity. Excessive Co levels may cause polycythemia, hypothyroidism, cardiomyopathy, and carcinogenesis, excessive Cr levels may cause nephropathy, hypersensitivity, and carcinogenesis, excessive Ni levels may cause eczematous dermatitis, hypersensitivity, and carcinogenesis, and excessive vanadium levels may cause cardiac and renal dysfunction, hypertension, and manic-depressive psychosis. Ceramic implants similarly form particles that cause the production of osteolytic cytokines from macrophages. However, aluminum particles cause significantly less irritation than PE and they cause lower releases of TNF-α and PGE2. Compared with MoM, ceramic-on-ceramic surfaces have less volumetric wear and, as a result, approximately 10-times less particle formation, which is an important advantage. The inflammatory response generated by the particles and the bone resorption they cause are lower than those caused by PE debris. Recent studies have shown that aluminum oxide (Al2O3) ceramic particles are less genotoxic to human cells than CoCr metal alloy particles in vitro. Al2O3 particles are not cytotoxic to, but they are weakly genotoxic to human cells in vivo . The tribologic performances of Ti implants covered with tantalum (Ta) were analyzed in vitro using laser techniques. Ta is preferable for implants, because it is highly resistant to corrosion and it is a biocompatible metal with a low ion release rate. The coating increases the mechanical and tribologic properties of the high carbon CoCrMo biomedical alloy. Surfaces that have been laser coated with Ta have been shown to be associated with a reduction in the development of wear debris originating from the movement of the bone implant interface during the early phase. It has shown that compared with Ti and stainless steel, Ta was highly resistant to corrosion and erosion, and that it did not undergo any significant changes with respect to weight or roughness. Tantalum is also the most compatible metal with osteoblasts . The role of osteoblasts has not been sufficiently elucidated; however, they may indirectly increase osteolysis through the cytokines they secrete, thereby reducing bone formation. Wear debris causes osteolysis by increasing osteoclast activity and suppressing bone formation , and normal osteoblastic activity is suppressed. Osteoblasts have an inflammatory signal response that is very similar to that of macrophages. Wear debris induces the activation of NFϰB and the release of IL-6, which disrupt collagen synthesis. This may cause the induction and persistence of the PPO cascade . Metallic and polymeric particles reduce the expression of collagen types I and III by the osteoblasts [38, 46]. Vermes et al. showed the antagonistic effect of wear debris on the procollagen a1(I) gene in osteoblasts in vivo. PE debris also reduces matrix production by osteoblasts. All of these factors negatively affect osteoblast activity and the resorbed bone cannot be replaced. Macrophages reduce their expression and release of matrix metalloproteins when they are exposed to wear debris in vitro. The findings from a study by Pap et al. showed that fibroblasts located in the areas of bone resorption had increased levels of expression of membrane-type 1 metalloproteinase (MMP), whereas periprosthetic tissues expressed MMP-1, MMP-2, MMP-3, and MMP-9. These findings suggest that increased extracellular matrix protease levels contribute to tissue destruction . The findings from numerous studies have provided evidence for the existence of factors that negatively affect osteointegration and result in local bone resorption. Recent studies have also focused on bacterial debris products [3, 48, 49]. Bacterial debris products have been detected on implants at high concentrations, and, recently, it has been determined that they inhibit osteointegration. This has led to the suggestion that the presence of a subclinical infection could be an etiologic factor in patients diagnosed with aseptic loosening. Infection rates are higher in inflammatory arthropathies and in immunocompromised patients. One study’s findings determined much higher concentrations of bacterial debris products in periprosthetic tissues . The best known bacterial debris molecule is lipopolysaccharide (LPS), which is found in the cell walls of gram-negative bacteria . Also, lipoteichoic acid from gram-positive bacteria, and lipopeptides and peptidoglycans from both gram-positive and gram-negative bacteria show effects that are similar to those of LPS . LPS has an affinity for biomaterial surfaces . LPS interacts with TLR4, which is found in the membranes of cells from numerous mammals. TLR4-related signal pathways activate macrophages through LPS and they induce an inflammatory response [52, 53]. When LPS interacts with TLR4, factors that include the myeloid differentiation primary response gene 88, IL receptor-associated kinase (IRAK) 1, IRAK2, IRAK4, and TNF receptor-associated factor 6, interact, causing a chain reaction that results in NFϰB activation, which leads to the release of proinflammatory cytokines such as TNFα, IL-1b, and IL-6 . LPS induces osteoblasts to release IL-1, IL-6, PGE2, and the RANKL. These mediators are responsible for the maturation and activation of the osteoclasts [54, 55]. Activated osteoclasts initiate local bone resorption. LPS also inhibits the differentiation of osteoblasts to osteocytes, thereby preventing new bone formation. This bacterial debris product, which has been detected in the osteolysis area, is from three known sources. First, LPS can be found at high concentrations on implants despite sterilization, and it is transferred to the body when the implants are inserted [56, 57]. The severe inflammatory response and the local bone resorption that is not associated with any clinical signs of infection may be explained by this mechanism. The United States Food and Drug Administration (USFDA) recently released an endotoxin guide, which states that the amount of endotoxin on an implant should be under 0.5 endotoxin units/mL. The USFDA also mandated companies that produce implants to reduce the LPS density by immersing the implants in water and removing them [53, 54]. However, while this method is effective for cardiac devices, its efficacy in relation to orthopedic implants remains controversial [49, 58]. Systemic endotoxins in the body may provide the second source of bacterial debris , and these may originate from the intestinal flora, minor infections, and dental procedures. Although patients who carry systemic endotoxins do not show any clinical or microbiological signs, wear particles from the implants are exposed to the LPS that is derived from the remote infection foci . The third source of bacterial debris is the bacteria that are present at subclinical concentrations on the implants and wear particles . It is clear that debris particles can lead to the production of degradation products, a highly inflammatory biological response, periprosthetic bone loss, and aseptic loosening. Bacterial debris is also detected during osteolysis. Since larger numbers of younger and more active patients are requiring hip prosthetic implants, gaining a better understanding of the biological activities of wear particles from the bearing components is crucial to determine the clinical effects of these particles, and to develop materials with improved wear and corrosion resistance. Despite advances in THA, wear-induced PPO and aseptic loosening continue to be major factors that affect prosthetic joint longevity. Biomarkers could be exploited as easy and objective diagnostic and prognostic targets that would enable testing for osteolysis after THA. Further research is needed to identify new biomarkers in PPO. Recent improvements in radiology will facilitate the early diagnosis of intracapsular particle disease before bone resorption occurs. As increasing number of more active and younger patients undergo THA, monitoring implant wear will become increasingly important. Pharmacologic treatment seems attractive, but there is no proven or approved drug therapy that can prevent or inhibit PPO. Furthermore, orthopedic surgeons should not think that more surgery will cure all of the problems associated with PPO. Given the biological mechanisms underlying PPO, greater emphasis should be placed on reducing PPO through early detection and nonsurgical management. This will maximize the efficiency and cost-effectiveness of THA. New research is needed to find new agents that stop the inflammatory process that follows the emergence of wear debris after THA. Greidanus NV, Peterson RC, Masri BA, Garbuz DS. Quality of life outcomes in revision versus primary total knee arthroplasty. J Arthroplasty 2011; 26(4): 615-20. Harris WH. Osteolysis and particle disease in hip replacement. A review. Acta Orthop Scand 1994; 65(1): 113-23. Dean JC, Tisdel CL, Goldberg VM, Parr J, Davy D, Stevenson S. Effects of hydroxyapatite tricalcium phosphate coating and intracancellous placement on bone ingrowth in titanium fibermetal implants. J Arthroplasty 1995; 10(6): 830-8. Gallo J, Raska M, Mrázek F, Petrek M. Bone remodeling, particle disease and individual susceptibility to periprosthetic osteolysis. Physiol Res 2008; 57(3): 339-49. Wataha JC. Materials for endosseous dental implants. J Oral Rehabil 1996; 23(2): 79-90. Pedersen AB, Mehnert F, Odgaard A, Schrøder HM. Existing data sources for clinical epidemiology: The Danish Knee Arthroplasty Register. Clin Epidemiol 2012; 4: 125-35. Paxton EW, Furnes O, Namba RS, Inacio MC, Fenstad AM, Havelin LI. Comparison of the Norwegian knee arthroplasty register and a United States arthroplasty registry. J Bone Joint Surg Am 2011; 93(Suppl. 3): 20-30. Illingworth KD, Wachter N, Maloney WJ, Paprosky WG, Ries MD, Saleh KJ. Advances in acetabular osteolysis: biomarkers, imaging, and pharmacologic management. Instr Course Lect 2014; 63: 177-86. Oparaugo PC, Clarke IC, Malchau H, Herberts P. Correlation of wear debris-induced osteolysis and revision with volumetric wear-rates of polyethylene: a survey of 8 reports in the literature. Acta Orthop Scand 2001; 72(1): 22-8. Bitar D, Parvizi J. Biological response to prosthetic debris. World J Orthop 2015; 6(2): 172-89. Rujitanaroj PO, Jao B, Yang J, et al. Controlling fibrous capsule formation through long-term down-regulation of collagen type I (COL1A1) expression by nanofiber-mediated siRNA gene silencing. Acta Biomater 2013; 9(1): 4513-24. Messier SP, Gutekunst DJ, Davis C, DeVita P. Weight loss reduces knee-joint loads in overweight and obese older adults with knee osteoarthritis. Arthritis Rheum 2005; 52(7): 2026-32. Gallo J, Goodman SB, Konttinen YT, Raska M. Particle disease: biologic mechanisms of periprosthetic osteolysis in total hip arthroplasty. Innate Immun 2013; 19(2): 213-24. Davies AP, Willert HG, Campbell PA, Learmonth ID, Case CP. An unusual lymphocytic perivascular infiltration in tissues around contemporary metal-on-metal joint replacements. J Bone Joint Surg Am 2005; 87(1): 18-27. Sinha RK, Shanbhag AS, Maloney WJ, Hasselman CT, Rubash HE. Osteolysis: cause and effect. Instr Course Lect 1998; 47: 307-20. Duisabeau L, Combrade P, Forest B. Environmental effect on fretting of metallic materials for orthopaedic implants. Wear 2004; 256: 805-16. Schramm M, Wirtz DC, Holzwarth U, Pitto RP. The Morse taper junction in modular revision hip replacement--a biomechanical and retrieval analysis. Biomed Tech (Berl) 2000; 45(4): 105-9. Jauch SY, Huber G, Sellenschloh K, et al. Micromotions at the taper interface between stem and neck adapter of a bimodular hip prosthesis during activities of daily living. J Orthop Res 2013; 31(8): 1165-71. Mistry JB, Chughtai M, Elmallah RK, et al. Trunnionosis in total hip arthroplasty: a review. J Orthop Traumatol 2016; 17(1): 1-6. Pastides PS, Dodd M, Sarraf KM, Willis-Owen CA. Trunnionosis: A pain in the neck. World J Orthop 2013 Oct 18; 4(4): 161-6. Mert M, Oztürkmen Y, Ünkar EA, Erdoğan S, Uzümcügil O. Sciatic nerve compression by an extrapelvic cyst secondary to wear debris after a cementless total hip arthroplasty: A case report and literature review. Int J Surg Case Rep 2013; 4(10): 805-8. Berend ME, Ritter MA, Hyldahl HC, Meding JB, Redelman R. Implant migration and failure in total knee arthroplasty is related to body mass index and tibial component size. J Arthroplasty 2008; 23(6)(Suppl. 1): 104-9. Wong J, Steklov N, Patil S, et al. Predicting the effect of tray malalignment on risk for bone damage and implant subsidence after total knee arthroplasty. J Orthop Res 2011; 29(3): 347-53. Aspenberg P, van der Vis H. Fluid pressure may cause periprosthetic osteolysis. Particles are not the only thing. Acta Orthop Scand 1998; 69(1): 1-4. Pap G, Machner A, Rinnert T, et al. Development and characteristics of a synovial-like interface membrane around cemented tibial hemiarthroplasties in a novel rat model of aseptic prosthesis loosening. Arthritis Rheum 2001; 44(4): 956-63. Goldring SR, Jasty M, Roelke MS, Rourke CM, Bringhurst FR, Harris WH. Formation of a synovial-like membrane at the bone-cement interface. Its role in bone resorption and implant loosening after total hip replacement. Arthritis Rheum 1986; 29(7): 836-42. Windisch C, Windisch B, Kolb W, Kolb K, Grützner P, Roth A. Osteodensitometry measurements of periprosthetic bone using dual energy X-ray absorptiometry following total knee arthroplasty. Arch Orthop Trauma Surg 2012; 132(11): 1595-601. Banerjee S, Pivec R, Issa K, Kapadia BH, Khanuja HS, Mont MA. Large-diameter femoral heads in total hip arthroplasty: an evidence-based review. Am J Orthop 2014; 43(11): 506-12. Musib MK. Response to ultra-high molecular weight polyethylene particles. Am J Biomed Eng 2011; 1(1): 7-12. Vermes C, Chandrasekaran R, Jacobs JJ, Galante JO, Roebuck KA, Glant TT. The effects of particulate wear debris, cytokines, and growth factors on the functions of MG-63 osteoblasts. J Bone Joint Surg Am 2001; 83-A(2): 201-11. Hodrick JT, Severson EP, McAlister DS, Dahl B, Hofmann AA. Highly crosslinked polyethylene is safe for use in total knee arthroplasty. Clin Orthop Relat Res 2008; 466(11): 2806-12. Ingram JH, Stone M, Fisher J, Ingham E. The influence of molecular weight, crosslinking and counterface roughness on TNF-alpha production by macrophages in response to ultra high molecular weight polyethylene particles. Biomaterials 2004; 25(17): 3511-22. Willert HG, Buchhorn GH, Fayyazi A, Lohmann C. Histopathological changes around metal/metal joints indicate delayed type hypersensitivity. Preliminary results of 14 cases. Osteologie 2000; 9: 2-16. Jacobs JJ, Roebuck KA, Archibeck M, Hallab NJ, Glant TT. Osteolysis: basic science. Clin Orthop Relat Res 2001; (393): 71-7. Goodman SB, Gibon E, Yao Z. The basic science of periprosthetic osteolysis. Instr Course Lect 2013; 62: 201-6. Wang CT, Lin YT, Chiang BL, Lee SS, Hou SM. Over-expression of receptor activator of nuclear factor-kappaB ligand (RANKL), inflammatory cytokines, and chemokines in periprosthetic osteolysis of loosened total hip arthroplasty. Biomaterials 2010; 31(1): 77-82. Purdue PE, Koulouvaris P, Nestor BJ, Sculco TP. The central role of wear debris in periprosthetic osteolysis. HSS J 2006; 2(2): 102-13. Atkins GJ, Haynes DR, Howie DW, Findlay DM. Role of polyethylene particles in peri-prosthetic osteolysis: A review. World J Orthop 2011; 2(10): 93-101. Witte F, Hort N, Vogt C, et al. Degradable biomaterials based on magnesium corrosion. Curr Opin Solid State Mater Sci 2008; 12(5-6): 63-72. Feyerabend F, Fischer J, Holtz J, et al. Evaluation of short-term effects of rare earth and other elements used in magnesium alloys on primary cells and cell lines. Acta Biomater 2010; 6(5): 1834-42. Pichler K, Kraus T, Martinelli E, et al. Cellular reactions to biodegradable magnesium alloys on human growth plate chondrocytes and osteoblasts. Int Orthop 2014; 38(4): 881-9. Catelas I, Petit A, Zukor DJ, Antoniou J, Huk OL. TNF-alpha secretion and macrophage mortality induced by cobalt and chromium ions in vitro-qualitative analysis of apoptosis. Biomaterials 2003; 24(3): 383-91. Tsaousi A, Jones E, Case CP. The in vitro genotoxicity of orthopaedic ceramic (Al2O3) and metal (CoCr alloy) particles. Mutat Res 2010; 697(1-2): 1-9. Vermes C, Roebuck KA, Chandrasekaran R, Dobai JG, Jacobs JJ, Glant TT. Particulate wear debris activates protein tyrosine kinases and nuclear factor kappaB, which down-regulates type I collagen synthesis in human osteoblasts. J Bone Miner Res 2000; 15(9): 1756-65. Jimbo R, Sawase T, Shibata Y, et al. Enhanced osseointegration by the chemotactic activity of plasma fibronectin for cellular fibronectin positive cells. Biomaterials 2007; 28(24): 3469-77. Pap T, Pap G, Hummel KM, et al. Membrane-type-1 matrix metalloproteinase is abundantly expressed in fibroblasts and osteoclasts at the bone-implant interface of aseptically loosened joint arthroplasties in situ. J Rheumatol 1999; 26(1): 166-9. Bonsignore LA, Anderson JR, Lee Z, Goldberg VM, Greenfield EM. Adherent lipopolysaccharide inhibits the osseointegration of orthopedic implants by impairing osteoblast differentiation. Bone 2013; 52(1): 93-101. Nalepka JL, Lee MJ, Kraay MJ, et al. Lipopolysaccharide found in aseptic loosening of patients with inflammatory arthritis. Clin Orthop Relat Res 2006; 451(451): 229-35. Henderson B, Poole S, Wilson M. Bacterial modulins: a novel class of virulence factors which cause host tissue pathology by inducing cytokine synthesis. Microbiol Rev 1996; 60(2): 316-41. Bi Y, Seabold JM, Kaar SG, et al. Adherent endotoxin on orthopedic wear particles stimulates cytokine production and osteoclast differentiation. J Bone Miner Res 2001; 16(11): 2082-91. Hirayama T, Tamaki Y, Takakubo Y, et al. Toll-like receptors and their adaptors are regulated in macrophages after phagocytosis of lipopolysaccharide-coated titanium particles. J Orthop Res 2011; 29(7): 984-92. Ishimi Y, Miyaura C, Jin CH, et al. IL-6 is produced by osteoblasts and induces bone resorption. J Immunol 1990; 145(10): 3297-303. Keeting PE, Rifas L, Harris SA, et al. Evidence for interleukin-1 beta production by cultured normal human osteoblast-like cells. J Bone Miner Res 1991; 6(8): 827-33. Ragab AA, Van De Motter R, Lavish SA, et al. Measurement and removal of adherent endotoxin from titanium particles and implant surfaces. J Orthop Res 1999; 17(6): 803-9. Guideline on validation of the limulus amebocyte lysate test as an end-product endotoxin test for human and animal parenteral drugs, biological products, and medical devices. US Dep Heal Hum Serv Food Drug Adm Drug Adm 2012; 1-30. Division of Manufacturing and Product Quality. Office of Compliance, in the Center for Drug Evaluation and Research in cooperation with the Center for Biologics Evaluation and Research, the Center for Veterinary Medicine, the Center for Devices and Radiological Health, and the Office of Regulatory Affairs at the Food and Drug Administration Guidance for Industry: Pyrogen and Endotoxins Testing: Questions and Answers. Rockville, MD: Center for Biologics Evaluation and Research, Food and Drug Administration 2012. Nelson SK, Knoernschild KL, Robinson FG, Schuster GS. Lipopolysaccharide affinity for titanium implant biomaterials. J Prosthet Dent 1997; 77(1): 76-82.